Leica gets the award for Most Improved Player. Virtually every complaint M8 and then M9 users had has been addressed, and the M platform is now technologically current. We still need to shoot with the new M to make sure the new sensor hasn't taken us backwards in any manner, but Leica seems confident that it won't, so we'll give them the benefit of the doubt for the moment. All in all, Leica has put together a strong offering in the M, and we still have the M-E and Monochrom M as options, as well. Adding R lens support opens up even more great lenses to the platform, and Leica didn't stop just at the camera itself: they've cobbled together some Olympus-made accessories (EVF, stereo mic) and a nice grip with GPS that actually start to make the M feel more system-like. The M does feel a little hybridish, what with the rangefinder at the eye and the LCD at arm's length, so the optional EVF goes a slight way towards fixing that. Of course, Leica's prices are at the top end of the mirrorless world, so we expect a lot from these cameras. Fortunately, we seem to get it. The Leica booth was alive with excitement and packed every time I went by. Big cheer here. Sony gets the award for Longest Attempted Field Goal. Sony was more than active. The NEX-5R and NEX-6 now give them a four-camera lineup with lots of strong players. The addition of WiFi and applications are both welcome, though need more fleshing out. We finally have some interesting and much needed lenses from Sony, too, with Zeiss and others promising to add to that and fill out the NEX lineup very nicely, thank you. NEX users should be happy campers right now, and some of the things that I saw here may force me to change the tone of my NEX-7 review coming up shortly. But I still can't feel like Sony left it just a little short of the goal line. Once again we've got technology overlaps that are a little tricky to explain (the 5R has phase detect autofocus, the top of the line 7 doesn't). We really wanted Sony to open up app writing to others. The lenses aren't quite here yet (and we're worried about how the pancake zoom will perform; is it another 16mm?). The complexity of what Sony is attempting with NEX, given both the still and video efforts, is amazing, and it's going well. A little more practice and they'll have it, I think. I didn't quite get the same level of excitement I found in the Leica booth, though. Still a lot of hard questions being asked by the Sony crowd, though they were enthusiastic by what they're seeing on the field. Mere effort doesn't win games, though. Great team, great potential, from here out it's all about delivery. Fujifilm gets the best trick play award. The hybrid X-Pro1 was the camera to have. Now it isn't. The smaller, lighter, less expensive X-E1 is the real play, and it plays as well as the camera it was derived from. Sure, some will lament the loss of the optical viewfinder option, but they can still pay the extra bucks for the X-Pro1 if that's really what they want. I suspect few will. The price change alone puts Fujifilm in the game. They've got an excellent, though still limited, lens set, and the news that Zeiss and others are going to be introducing lenses into their mount as well was just what the fans wanted to hear. The X-E1 area in the Fujifilm booth was mobbed pretty much from minute one of the show. I wasn't hearing a lot of complaints from people handling the camera for the first time. Fujifilm's in the hunt, folks. m4/3 gets their contract renewed. As the veteran players in the game, they've earned their spot in the lineup and continue to perform well. Really well. Both of these guys are beefing up and getting better each passing season. The GH3 looks like a nice solid update that'll please the GH2 crowd. The new Panasonic lenses all tickle my fancy. It's nice that Panasonic says they're making a commitment to pro, and if we could just get that into their marketing and distribution behavior, too, we'd be all there with them. The coaches will need to work on that with them during the off season. Meanwhile, Olympus isn't exactly sitting still, either. They've beefed up their sensor, they've extended their desirable lenses, they're talking about the future the way we fans want to hear it. The two players still complement each other well, too, with neither tripping over the other and both filling any gaps they find. And you've got to love that they're recruiting more players onto the team (though Zeiss is playing a bit coy). Seriously, m4/3 is being done right. Exactly the way that 4/3 wasn't. Oh, the 4/3 lenses were fine, it was all the stumbling over bodies and being unable to clearly differentiate from competitive DSLRs that troubled the 4/3 initiative. It's good to see players learn from previous mistakes. It's good to see them continue to improve. I'm liking the latest m4/3 products a lot, and they're to be congratulated on getting to what I'd call the first full system first. But it's a cruel world: so now make it even better. Don't play last week's game, guys: the big games are still coming up. Canon is the expansion franchise nobody's quite yet seen play. Oh, those of us at Photokina got to scrimmage with it, and there's some very good news (quality) and some hopefully not bad news (focus was slower than I would have liked, but the camera's not shipping yet, so really tough to evaluate). Canon seems a little unsure what style they want to play, too. Is it a ladies in-lieu-of-DSLR cheerleader, ala the Nikon J1, or is it a serious player with serious moves? Lenses will be part of that answer, and other than the pancake and the kit zoom, we have no clues yet. Basic vanilla plays every competitor runs. Check back with me a few weeks into the season. Samsung is the team I can't figure out. On paper they're nearly a dream time: they've got (sensor) size, skill, a nearly full set of players (lenses), some clever plays (WiFi), the complete package. Yet after the big pre-season team introduction they mostly went quiet. They seemed to cede Photokina to the other players, as if they were afraid of getting beat up. They certainly haven't cracked the fan base yet. Their team jerseys are the lowest selling of all the gear being sold, and no one really seems to want to claim they're a fan of the team. The funny thing is that Samsung in many of their many markets, are marketing and sales whizzes. But they seem unable to figure out how to crack the camera market. Their gear is good, as my reviews attest. They actually make very nice cameras, thank you, and their lenses are just as good. But they're not winning the game. It's not the lineup. It's not the development program. It has to be the coach and the game plan. Fire the coach! Get a new game plan! Kick the damned ball! Hasselblad appears to be on drugs. We'll be calling them in for testing soon. Worse, they're on recreational drugs, not those performance enhancing ones. How 60's. Oh, wait, they made references to the 60's in their presentation, didn't they? OMG. Pimping cameras isn't going to make it in this league. Now, it may put a few bucks into Hasselblad's pockets before people figure out the deal. Or it might not. What's stopping me from buying NEX-7's and putting new skin on them? Here's the thing that calls out the recreational drug reference: Hasselblad went to great lengths to describe the materials they'd use to pimp out the Lunar: wood, carbon fiber, and yes, even gold. This isn't pimping out via bejeweling, this is pimping out for status using those expensive materials that only the rich need stuff made of. The kind of status you might get if you'd just by one of the ubiquitous Leica special editions and just put it in your jewel case. Doh! After being criticized, Hasselblad went into damage control (or came down off their high) , saying they might be doing photography-oriented upgrades in the future, too. Show me the pixels! Otherwise, no deal. Show me the pixels! Nikon gets sent to back to the practice squad and will have to play their way back onto the field. Really, what's going on here? In discussions with the European product managers they seem happy and point out that the Nikon J1 is the best selling mirrorless camera in Europe (I've asked for them to be more specific with that claim and send me supporting evidence). The J1 will be a hot seller in the US soon, too, as Nikon lifts the MAP and lets the prices go into free fall very shortly. The V1 doesn't sell nearly as well, by their own admission. But it seems that they think of mirrorless only as First Step Above compact camera. It's a Coolpix replacement, not a truly serious photographic tool in their mind, and that shows in the way they use and promote it. Nothing wrong with that, of course, other than the fact that GH3's and OM-Ds an NEX-6s and now Leica M's and Fujifilm X-E1's are being bought by the crowd that's getting tired of Nikon not delivering the goods in DX and not giving them small, light, high-end solutions. Sing compact, sing compact, but quality will out in the end (yes, that's an Aeschylus reference). 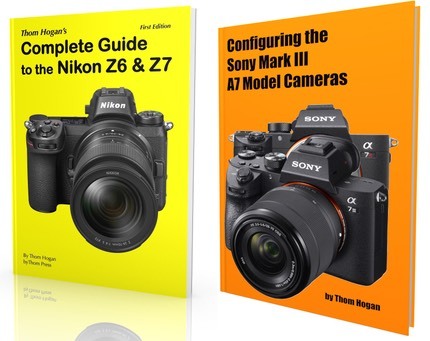 Simply put, the J2 and the 18.5mm f/1.4 were a pretty meagre offering a year later, and you could see that in Nikon's booth: the only Nikon 1's getting lots of love were the ones being used by Nikon themselves. (Of course, Nikon's booth had tremendous enthusiasm for the new D600, the D800, and video.) Nikon's playing in the wrong league, with the wrong lineup, and with the wimpiest players. That won't win games.